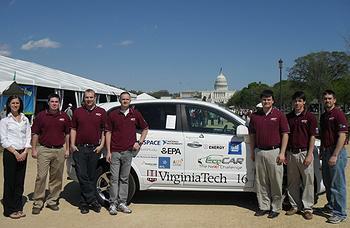 WASHINGTON, DC, June 17, 2011 (ENS) – A team of students from Virginia Tech University was named the overall winner of EcoCAR: The NeXt Challenge after designing and building an extended-range electric vehicle using E85 ethanol. The winners were announced Thursday night at the culmination of the three-year competition sponsored by the Department of Energy and General Motors. Taking second place, also with an E85 extended-range electric vehicle, was Ohio State University. “Our team is very happy with our second-place win,” said Katherine Bovee, a BS/MS mechanical engineering major and team co-leader. “The Ohio State team undertook a pretty large technical challenge. We reprogrammed our own engine controller and our own supervisory controller and integrated a lot of other components. The University of Waterloo from Ontario, Canada took third place with a hydrogen fuel cell plug-in hybrid electric vehicle. The EcoCAR competition, managed by Argonne National Laboratory, challenges 16 selected universities across North America to reduce the environmental impact of vehicles by minimizing a GM-donated vehicle’s fuel consumption and reducing its emissions while retaining performance, safety and consumer appeal. “The ingenuity and dedication shown by the students of Virginia Tech in building this next-generation vehicle will help them launch careers as leaders in the clean energy field,” said U.S. Secretary of Energy Steven Chu. “With the experience and skills these innovative students have gained through the EcoCAR competition, they will help reduce our nation’s reliance on oil imports and keep U.S. industries competitive in the global marketplace,” said Chu. The EcoCAR competition challenged participating engineering students to re-engineer a GM-donated vehicle to minimize the vehicle’s fuel consumption and emissions, while maintaining its utility, safety, and performance. Throughout the competition, the Virginia Tech team hit incremental goals that helped the vehicle achieve the equivalent of nearly 82 miles per gallon – a 70 percent improvement in fuel efficiency over the stock vehicle. During Year One the Virginia Tech Hybrid Electric Vehicle Team, based in Blacksburg, Virginia, selected a vehicle architecture that would result in the most effecient vehicle that team members thought would best fit consumer’s needs. During Year Two, the vehicle was shipped from General Motors Corporation. Year Two’s work consisted of integrating Year One designs into a functional vehicle. At the end of Year Two, all 16 teams met for a competition at GM’s Desert Proving Grounds in Yuma, Arizona, which resulted in a second place finish for Virginia Tech. In Year Three, the vehicles were refined to near-showroom quality. The 16 teams tested their vehicles at the U.S. Environmental Protection Agency’s National Vehicle and Fuel Emissions Laboratory in Ann Arbor, Michigan for emissions and fuel or energy consumption. 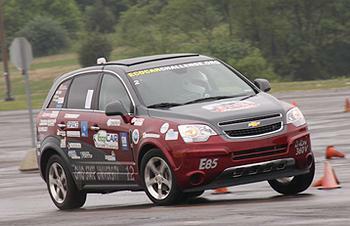 Last week, all 16 teams participated in final testing events at General Motors’ Milford Proving Ground in Michigan. The EcoCARs went through safety, emissions, and other technical inspections in the same facilities used to test GM production vehicles. Technologies being tested included: plug-in hybrid electric vehicles, extended-range electric vehicles, fuel cell plug-in hybrid electric vehicles and full-function electric vehicles.